When dealing with the societal and environmental challenges we face today, the most common approach is often the same. For example, putting our faith in some new technology that has been developed in a lab in Geneva or from a secret military base in the Nevada dessert. However, the best way to face challenges is often to use existing resources and technologies in new ways. An excellent example of this is the social enterprise Apopo. Back in 1995, its founder, Baart Weetjens, analysed the landmine problem in Africa, and was surprised by the complexity and high technological levels of expensive mine-clearing solutions that were largely proposed by research institutions outside the continent. By relying on locally available resources his solution has turned out to be cheaper, quicker and more scalable, yet efficient: Apopo trains the widely present African Giant Pouched Rat to detect landmines, which, at the same time as it saves lives, provides local jobs for the economically disadvantaged. The Apopo model has since been expanded and now operates in Mozambique, Thailand, Angola, and Cambodia as well, where the HeroRats so far have neutralized 3,244 mines. In addition, the rats have now also been trained to detect tuberculosis and have to date screened 198,610 samples in Mozambique and Tanzania. Baart’s innovation not only creates jobs and saves lives as well as costs – it also represents a significant shift in the field from landmine-affected countries depending on foreign expertise to having the power to control the demining process, and the same goes for tuberculosis detection. The Apopo case is illustrative of how social entrepreneurs create value: they develop social innovations that meet needs that are either overserved because the existing solutions are more complex than required – or not served at all because of market or government failure. They often do this more efficiently, effectively and, if not profitably, at least sustainably by combining resources and tools from different worlds, blending market and non-market approaches, building alliances across sectors and professions and by having lower cost structures and more efficient delivery channels. Apopo also tells us an important lesson regarding how we face problems. The resources and competencies to solve issues are often right in front of us, we just have to apply them in a non-traditional manner. To do this we must learn to break free from our preconceived notions and start seeing things for what they really are. Rats are often seen as destructive disease carriers, but as the case above shows, even they contain the potential to save both money and lives. 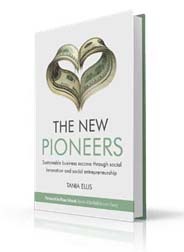 The New Pioneers are this century’s generation of new leaders, social entrepreneurs, and social innovators that are turning global challenges into new business opportunities and sustainable ways of creating value. Our Case of the Month features New Pioneers that are creating new hybrids of doing business and solving society’s problems. They are showing old world companies and organizations how to tackle new world challenges for the benefit of both humanity and the bottom-line.